Looking for a fun adventure this Sunday (July 31st)? 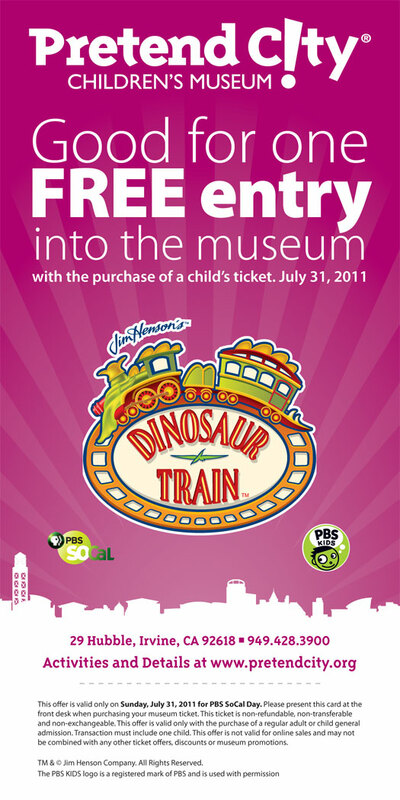 Dinosaur Train will be making a stop at the Pretend City Museum in Irvine from 10am - 3pm. Buddy the Dinosaur will be there to take pictures with the kids and the kids will also have a chance to see a special preview of the new Dinosaur Train movie "Dinosaur Big City" which is set to air the end of August on PBS. Print out the about image for a 2 for 1 pass for free adult admission with the purchase of a child's ticket for the day. For more information about pretend city you can go here.